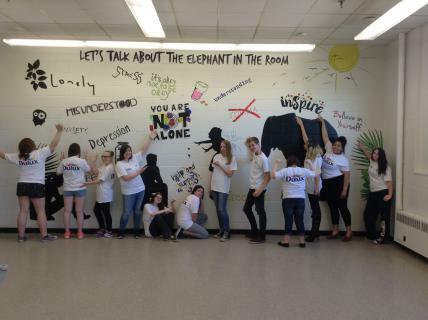 Students from Hants North Rural High (HNRH) in Kennetcook took a creative approach to show their support for those dealing with mental health issues in their school and community. Members of HNRH’s We ACT collaborated with a local artist to design a mural to increase understanding of mental health. The mural has been completed and is enjoyed by the entire student body in the school lunchroom. The students who worked on the mural hope it starts a positive conversation around mental health, both inside and outside of the classroom. Supplies for the mural were purchased with the support of a wellness grant from the East Hants Community Health Board.